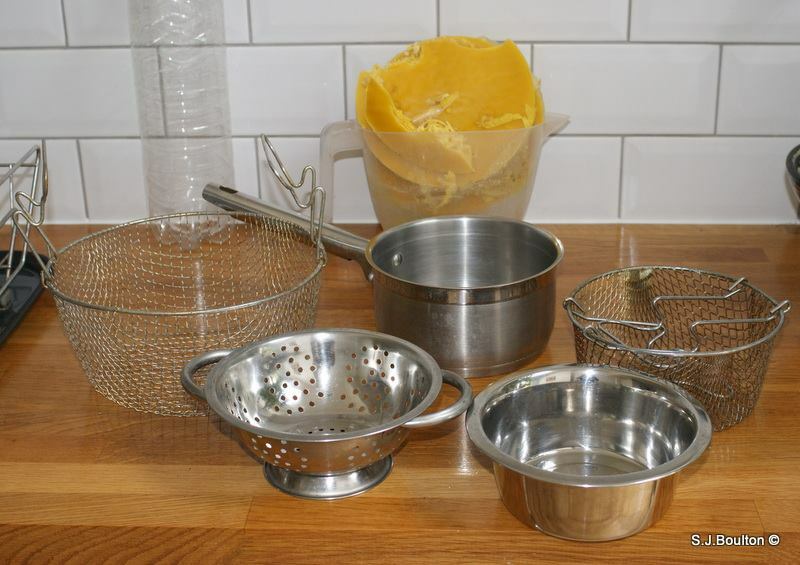 When I started thinking of making things with my spare beeswax I looked at getting a Bain Marie due to the low flash point of wax and the mess it can make with your everyday kitchen equipment. Anyway the same day as I was heading to town to get one i saw my neighbour putting these in the bin , with a clean up they are now my wax filtering and melting kit. So the saucepan has hot water in then the dog bowl sits inside and you put the wax in there , a free Bain Marie. 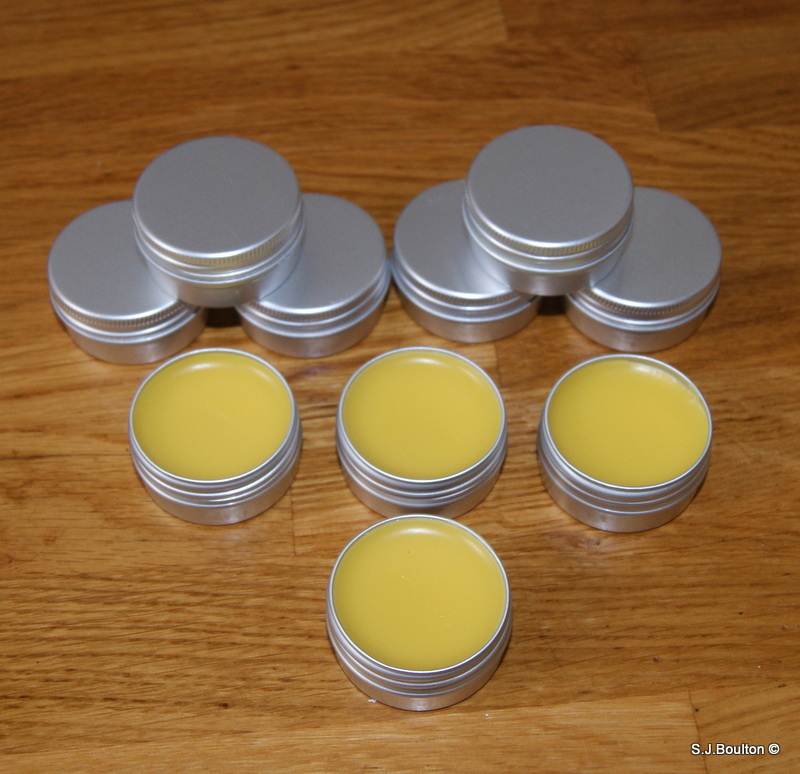 Pure beeswax is solid at room temperture. It will have a putty like consistancy at above 80-90 degrees F and will melt around 145-147 degrees F. Depending upon what you are using it for you may just let it sit in a bowl of hot tap water for a few minutes to allow it to turn into a putty like consistancy. 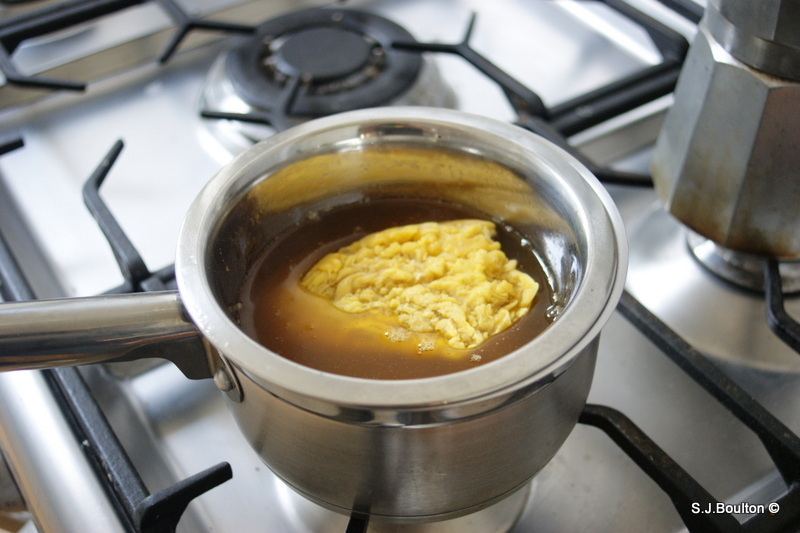 To melt beeswax use a double boiler (a pot within a pot of water) this allows gentle heating which is important because beewax can burn rendering a browning hue and lose its aroma. Remember beewax is used in candle because it is flammable so be carefull near an open flame or a heat source. Do not exceed 160-170 degrees for any long period of time and you should fine. 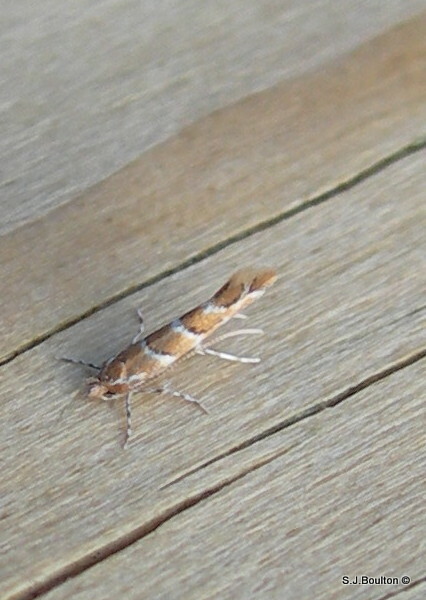 Larvae are also small – up to 5.5mm long. The moth’s leaf mines are easily recognised as multiple, conspicuous whitish yellow and brown blotches on the surface of horse-chestnut leaves and cause significant browning towards the end of the summer. Melt the oil and beeswax together stir in essential oil and then transfer to a small containers. If a thicker gloss is desired, increase the amount of beeswax. (Experiment with other additions such as baking chocolate, crushed peppermint candy, cocoa butter, vanilla bean, oil of cinnamon, oil of camphor or eucalyptus for soothing chapped lips, wheat germ oil, etc. Boil honey with 1 part honey 2 parts water. Boil for 10 minutes and skim off the foam that forms (The foam will contain water impurities). Pour honey water as well as raspberries in fermenter and then fill to make 1 gallon of mixture. Add acid blend, pectic enzyme. In a small bowl, add yeast a bit of water to re-hydrate it and yeast nutrient. Let it sit until it starts to bubble then add it to the must. After 3 weeks rack into another fermenter. After 3 months rack into another fermenter. Let it sit for 3 months then bottle. Let the bottles sit for 6 months before you drink it. Add pealed and chopped apples with the blackberries to about half a gallon of water and bring to the boil then I blend it with a hand blender and add the sugar. Allow to cool then add the lemon juice , Pectin , Yeast and yeast nutrient. Then pour in to a clean demijon and add air lock leave for a few days the mash will rise to the top and the mixture will start to bubble. Then rack off into another clean demijon filtering out all the mash. Top up with water and put somewhere warm to ferment. Once fermentation is complete then you can either rack off again to a clean demijon to settle out or add a settle pack to speed up the settlement and clearing of the wine. I love the simple pleasures in life from home brewing with either home grown or foraged fruit. Building up stores for the winter months and to share with friends etc . Apple and blackberry wine on the left and as posted before the Raspberry melomel mead on the right. 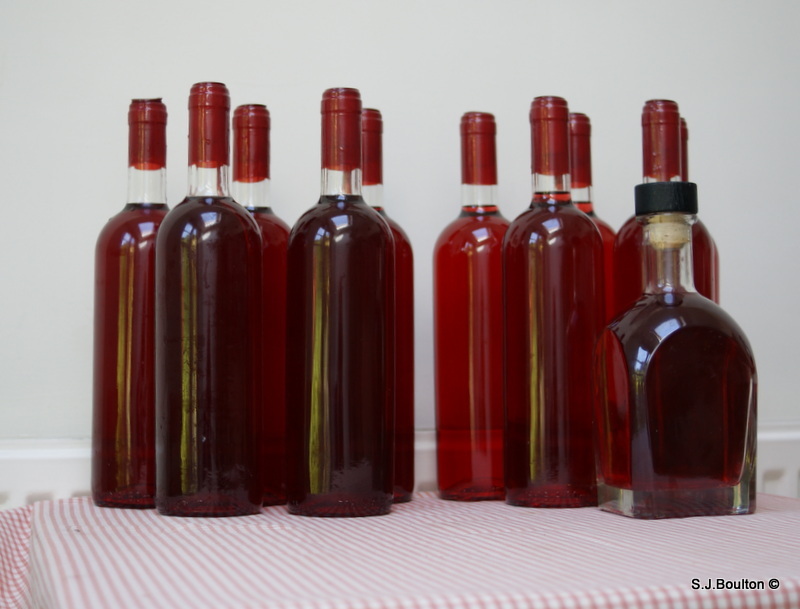 I only have another 6 demijons to bottle over the coming months. 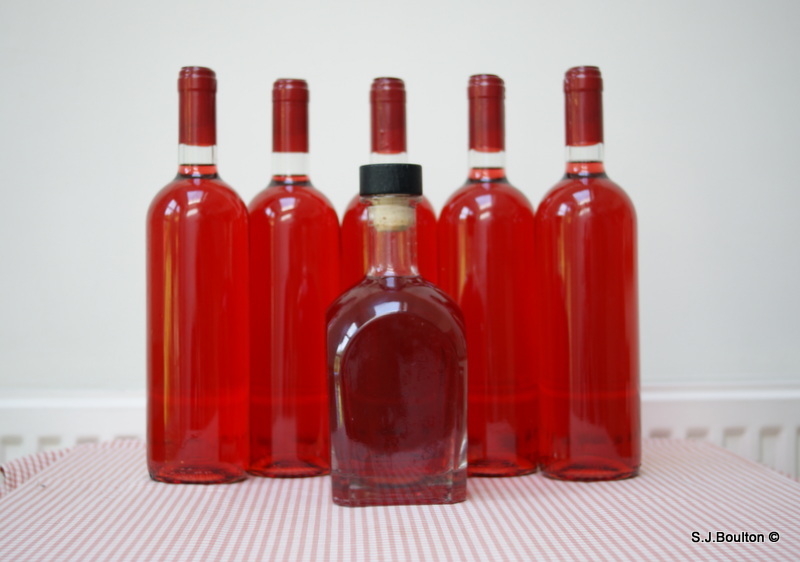 The Raspberry melomel mead is now finished fermenting and cleared . Bottled and ready to store till at least christmas.